Let me know if you’ve heard this one before. 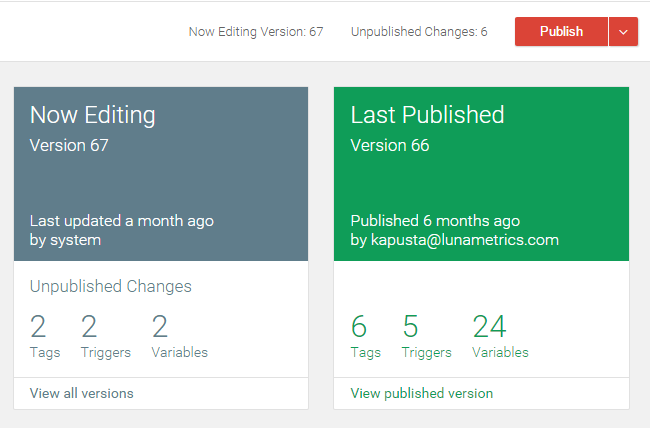 You have a developer building out some tags in Google Tag Manager, but they’re not ready to be published yet. They have several tags with major changes, new tags, different triggers and variables. Lots of changes. Then you get a notification that you need to quickly add a different remarketing pixel to a single page. 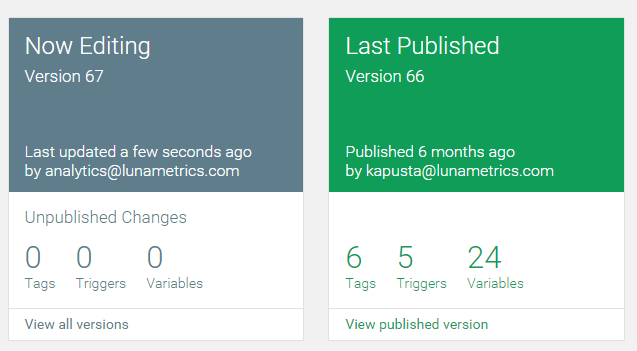 This is tough at the moment in Google Tag Manager. You don’t want to publish what’s in the container, it’s not ready, but you need to just add a quick tag and get it up on the site. First, tell the developer to stop working in GTM while you do your stuff. You don’t want two people interfering with each other during this process. 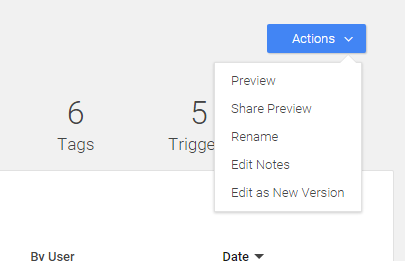 Second, go into Google Tag Manager, and on the main Container page look at the green area on the right with the Last Published Version. Click on the ‘view published version’ link there. Third, on the version page for the published version, there is a blue button on the top right with ‘actions’ on it. Click that and choose ‘edit as a new version’. You’ll get a popup that asks you to replace the current container draft with the content of this live version. There is a checkbox there to ‘save the current container draft before editing’. Make sure that stays checked, and then click edit as a new version. The system may spit out a couple of quick messages up top, but you probably won’t get redirected anywhere. Click back to the main container page though and you should notice that the ‘now editing’ version, i.e. your container draft, is now empty. You’re good to make your single change. Add your new tag, make your single tweak, and then publish your new version. Then repeat the process from above from that version, and go to ‘actions’ and click ‘edit as a new version’, except this time UNCHECK the ‘save the current container draft before editing’ button, as you don’t need to make a blank version with no changes in it from the current empty container draft. Then once you click through there, and return back to your main Container Draft. Your new working version will have the developers work still in there, ready for him to return to it, while your little tweak is now published and live. You have to add the single tag to this version as well. It’s a little complicated, but you don’t have to feel like you’re hijacked from making any little changes if you use the above process. Get Tagging! If you’re looking for additional ideas, we’ve also written about how to accomplish this by using triggers and trigger exceptions. Check out this post on trigger exceptions and pay particular attention to the Blocking – Regular Site Visitors trigger.